Given all the violence we have witnessed in America, I want to share with you a movement that inspires me--a bold plan to counteract America’s 100 million acts of violence every year. Not with legislation, rhetoric, or more sedatives and tranquilizers...but with the most powerful force on the planet: the love and conscience of an awakened people. 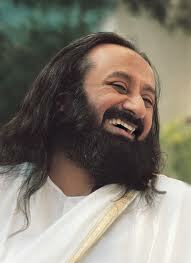 This month, the Art of Living is launching a national movement lead by Sri Sri Ravi Shankar, founder of AOL. He is an internationally acclaimed humanitarian, a nominee for the Nobel Peace Prize, and the recipient, this month, of this year’s Ghandi-MLK-Ikeda award for Nonviolence bestowed by Morehouse College. For over 30 years, his mission of uniting the world into a violence-free, stress-free global family inspired the lives of over 300 million people who participated in Art of Living programs, in over 151 countries. Sri Sri has been a strong supporter of the anti-corruption movement in India, a voice for women’s empowerment throughout the world, and an advocate for countless other humanitarian causes. Starting March 25, through April 3, Sri Sri will be visiting the US during his five-city tour through San Diego, L.A., Chicago, New York and Atlanta. The New York event will launch March 30th in the Dag Hammarskjold Plaza, in midtown Manhattan at 2pm. We invite you to join us at the event and to commit to your own act of non-violence. ( http://nonvio.org/ ) With our commitments, we will make the voice of non-violence louder than violence. Together we will reach 1 billion acts of non-violence. frustration, anger and revenge and make these a role model for children." Nonviolence: No Higher Calling seeks to make the voice of nonviolence loud; for every action of violence we commit to 100 actions of nonviolence. We start now, together. Commit today to an action of nonviolence at nonvio.org.